The rich purple of this yarn reminded me of the black yarn that has traditionally been used as a background for granny blankets, but with a fun modern twist. 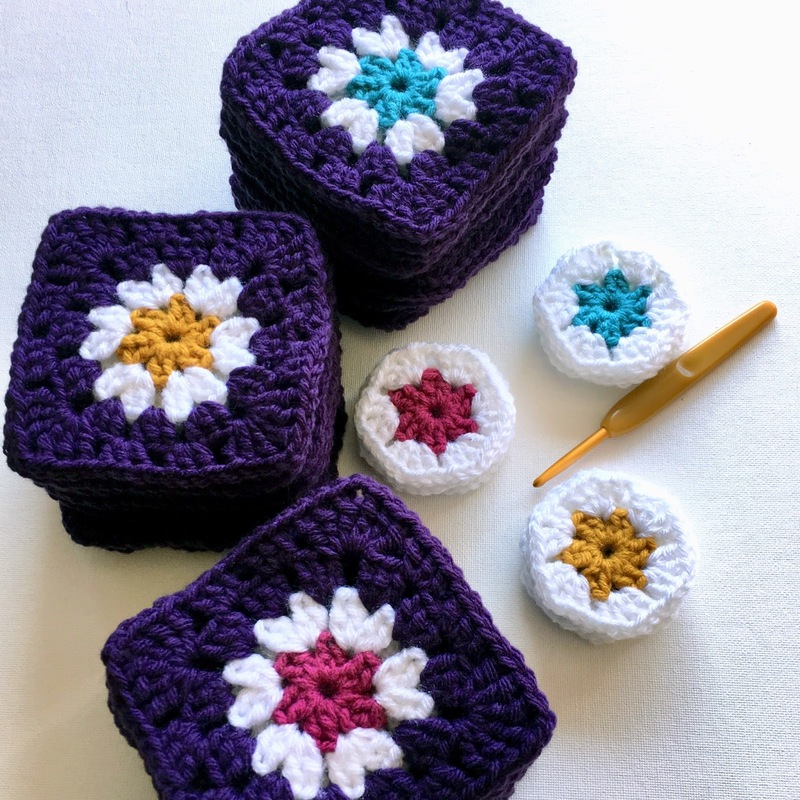 The white of the daisies and the white yarn bordering the squares when joined is an example of contrasting dark and light colors, which is one way to approach color choice in crochet. 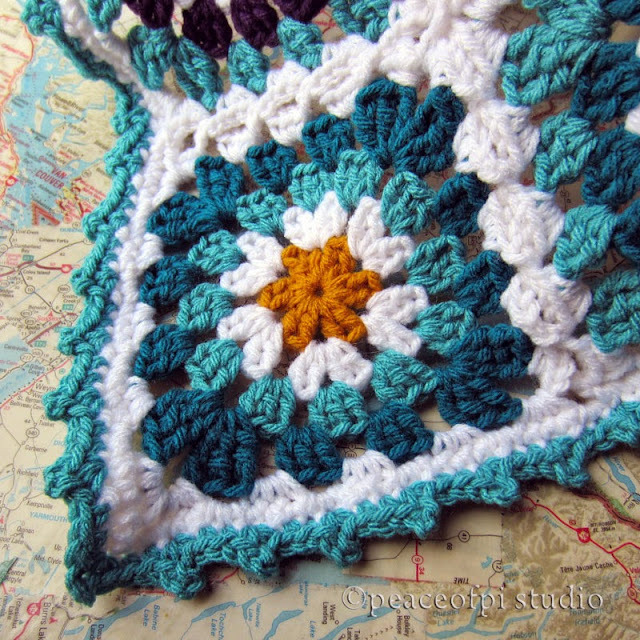 In crocheting my first granny blanket with this flower motif, medium and dark shades of teal yarn were my first color decisions. Every color I chose after that had to match (to my eye) the turquoise shades. This is another way to make color choices - choose one color as a starting point or main color. Each subsequent color must match the main color. This will result in an overall well matched, well balanced finished project. For this throw, choosing white to connect the grannies join-as-you-go style lightened and brightened the blanket, and white yarn was already part of the original granny square so it was sure to unify the blanket. 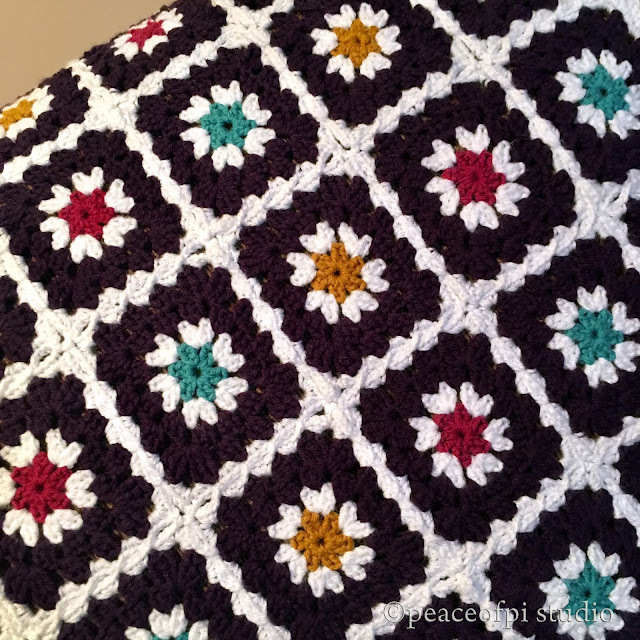 (see more about this granny blanket in this post). One of the nice things about color choice for granny squares is that it only takes a small amount of yarn to test color combinations. 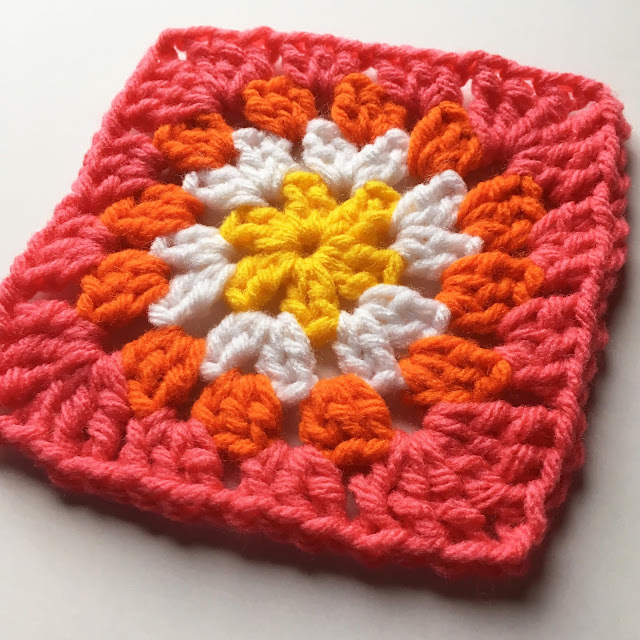 For example, with this pink granny, I was testing how the coral shade of pink looked beside the bright orange yarn. There isn't very much contrast between these colors. Would the colors blend, clash, disappear or pop? The result, I think, is a VERY bright cheerful square, with the colors blending nicely. Here's a tip: Colors that are opposite on the color wheel really pop when placed side by side while colors beside each other on the color wheel tend to blend more harmoniously. Either choice is good, just experiment and see what you like. Don't be afraid to use a color wheel to help make yarn choices. A small one is all you need. Crochet with Color is a great resource. 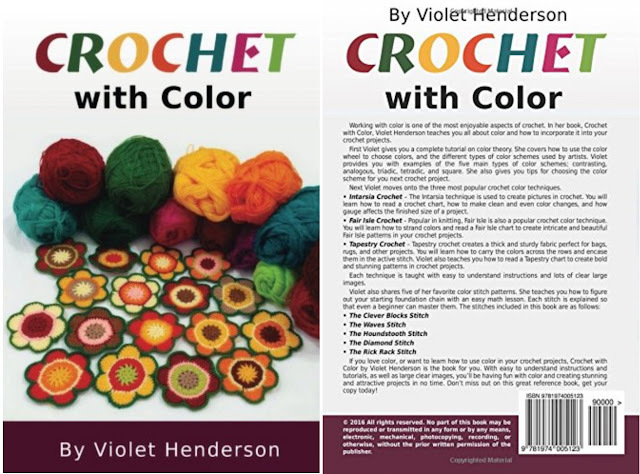 It covers color theory in detail and then shows how it can be applied to crochet projects, going beyond grannies into different types of crochet stitches and styles including Tapestry and Fair Isle Crochet. It's a must have addition to any crochet library. 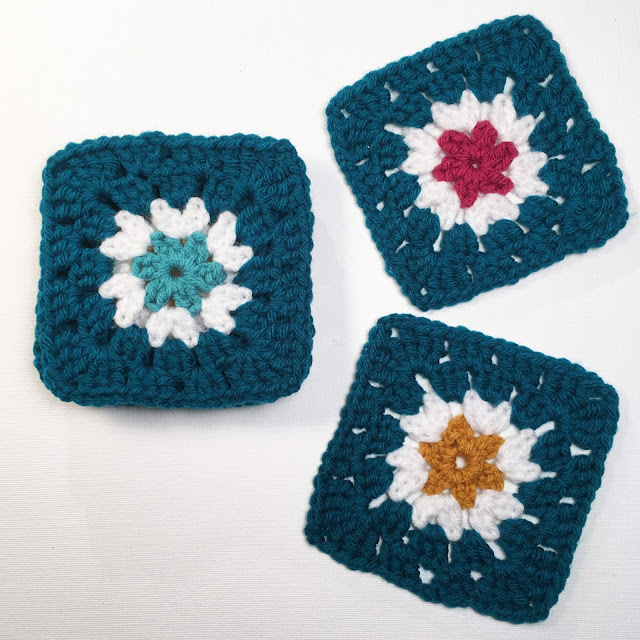 The flower granny in all these examples is a favourite of mine called the Little Circle Square. The pattern can be found over on crocheter Kate's blog here. I have made this granny over and over. Here I used two rounds of dark teal yarn. This is another striking color combination where the lightness of the white is contrasted with the deep dark shade of teal, making the daisy motif stand out. Experimentation is a great way to find color combinations that really sing and granny squares are a great place for the crocheter to try color combinations out. Along with inspiration and advice from the experts in books like Crochet with Color any crocheter can make a stunning colorful project.